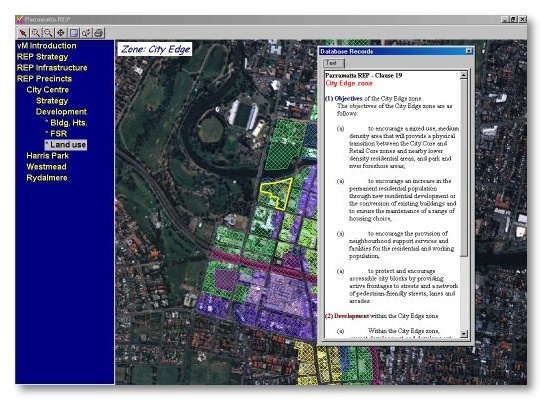 The reporting and communication of information has become a multi-skilled activity demanding compatibility with a diverse range of data and information formats such as formatted text, vector and raster GIS layers, tabular data and charts, HTML, bitmaps, documents, multimedia files, spread sheets, video, photos and aerial imagery. 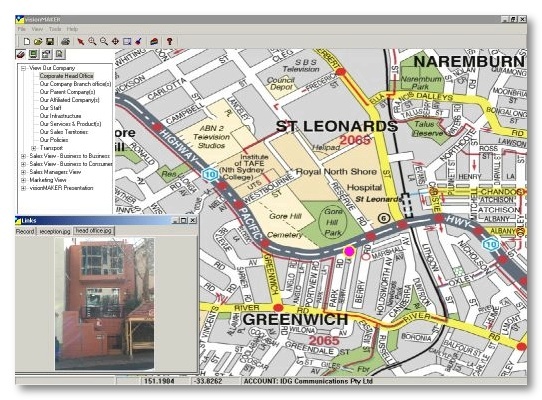 Standard GIS software can co-ordinate and display GIS layers (with associated tabular data) and some images, but much of the data formats cannot be integrated effectively into existing software packages. visionMAKER™ was created to fill the gaps, utilising an intuitive interface. visionMAKER™ can help you integrate just about any data formats to create an effective knowledge interface (or knowledge base) containing live GIS data that can be linked to external data formats. The real power of visionMAKER™ lies in its purposefully simplistic and intuitive user interface. The interface has been designed for non IT trained management and customer services staff. It is intrinsically easy to use (ie. intuitive) and allows personalised access to the underlying data. Regular data analyses can be tailored to individual user’s requirements and the data is instantly updated as soon as visionMAKER™ is turned on ie. visionMAKER™ reads all data files on an “as is”, live basis. 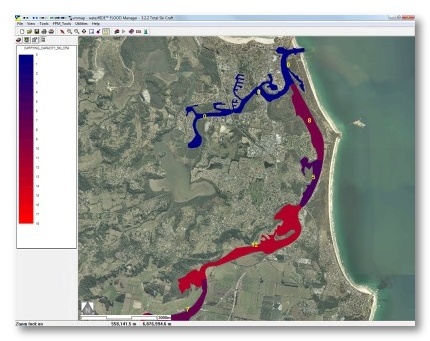 Unlike conventional GIS applications, where it is assumed the user has knowledge of the datasets they wish to access, visionMAKER™’s unique interface allows “project developers” to setup combinations of layers, so that the end user can simply access information with a single click. This is achieved through a “tree structured” table of contents (TOC), providing access to any number of “views”. Each view contains a number of layers, setup by the “developer” as part of the “story” structured by the TOC. The end user simply clicks on the appropriate item in the tree to access the information. Personalised access to data, through an intuitive interface, empowers senior management with the ability to call up relevant data instantly during impromptu meetings and discussions or to assist decision making in an emergency. visionMAKER™ is available as a creator version for development and editing of shows or scripts, and as a viewer version for distribution with the data. Simplified, intuitive interface – navigation is guided through a structured Table of Contents (ToC) allowing access to “views” – data access is quick and easy. 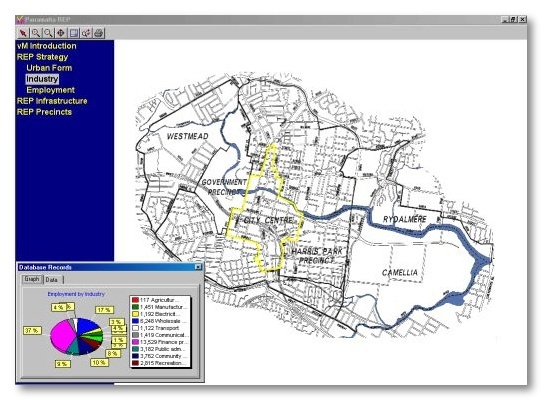 Designed for use by general computer users – you do not need to be a GIS or computer expert to use the software. GIS and general layer visibility and display styles are setup individually for each view, allowing the end user to simply click on the view they would like to see, without needing to know which layers to turn on and off. A well-structured ToC tells a story, allowing users of the project to easily access the information they need, without minimal (or no) training. Any file that can opened using a Windows “double click” can be linked to spatial objects (eg photos, movies, spread sheets, PDF’s, documents, charts, websites, etc). Direct or Value-based linking: Either link external directly data to an object, or link using field data in a GIS layer (eg all properties with the TYPE field value of “Housing” could be set to access a PDF document on residential housing construction requirements). All data is live, referenced from source files. If the source file changes, so does the data accessible using visionMAKER™. 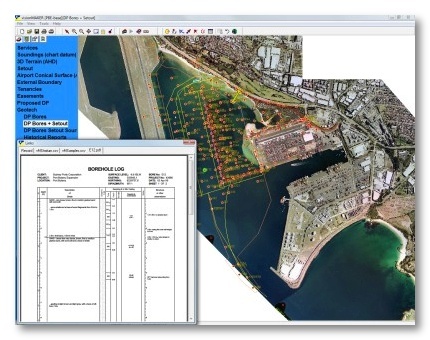 Can be readily setup as a spatial/non-spatial data management system. Control access to data using simple file/user group permissions. There is negligible overhead in managing systems. Thematic mapping of key database information can provide valuable insights into important clients, trends, areas of focus, groups or clusters and be useful in business planning and intelligence. The value of the data at a point, or in a region is represented by its colour. Links windows (at left on above image) shows a chart linked to the highlighted area. Links window shows formatted text associated with the highlighted GIS item. 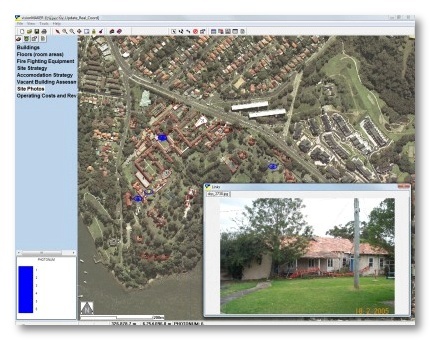 View window can include any GIS datasets such as airphotos, and vector and raster GIS layers (ESRI, MapInfo, AutoCAD, MicroStation, Google Earth). Camera icons (or other symbols) can be located on a GIS layer to indicate the location of photographs. Clicking on a camera highlights the orientation of the view, and the links window shows the photo. Text associated with the photo is available through selecting the appropriate tab button on the links window. The amount of information, and the style that it can be displayed in, is limited only by the imagination of the user. Access GIS data without needing to be a GIS expert. Left click on an object to bring up the GIS tabular data associated with that object. visionMAKER allows you to link any external files to entities (points, lines or polylines) in your GIS datasets. Linking can be based on the entities themselves (ie files are linked to a specific entity) or GIS field values (files are linked to a specific value in a field, which may occur for many GIS entities). A combination of link types can also be used. When the entity is clicked any linked file(s) are displayed in the links window, on separate tabs. There is no limit to the number of files you can link. visionMAKER™ allows the end user to access “specialised” without the need to be an expert in that data (or know how to use specialised software). Any interpretation of the data can be included in the linked information (in this case a PDF report), allowing the end user to simply access the data they need. Hierarchical menu bar at left automatically expands and contracts as items are selected. View window (right) shows GIS layers associated with current menu selection (the current view). GIS items are highlighted as the mouse pointer is passed over them. Buttons on toolbar enable panning, zooming, etc of the view window. Any dataset that can be “double clicked” in windows can be accessed using OLE in visionMAKER™ (ie open in the native application). 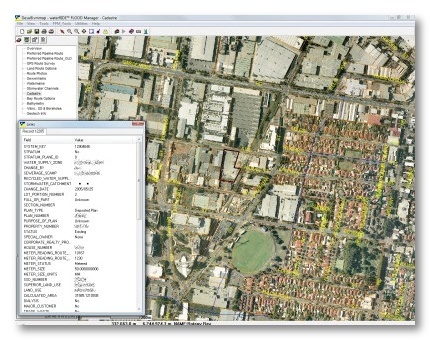 visionMAKER™ is designed to make accessing and distributing access to spatial and linked non-spatial data easy. As such, anyone who needs to access or share information that has a “real-world” context will find visionMAKER™ useful. 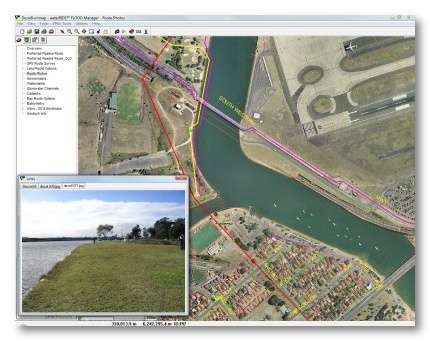 At the technical end, visionMAKER™ is used by GIS operators and managers of disparate datasets (often specialised) to provide quality controlled access to information. At the end user level, visionMAKER™ is suitable for use but anyone, even those with only basic computer skills. visionMAKER™ Developer is available as both standalone and network (LAN/WAN) license. visionMAKER™ Viewer is freely available for distribution. 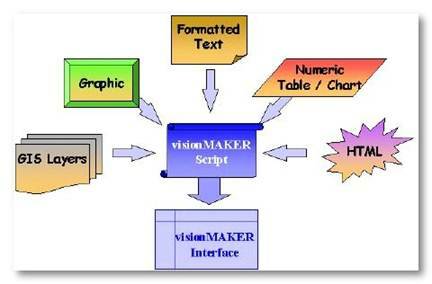 A Developer license is required to setup a visionMAKER™ project. The Viewer license allows end users to open and access any visionMAKER™ project. All waterRIDE™ software is Licensed subject to our License Agreement.